China's Tiangong 1 space lab and its Chinese Long March 2F rocket is transferred to the launch site. China is making final preparations to launch its first space lab module — a prototype for a future space station — this week, state media reported. The unmanned Tiangong 1 ("Heavenly Palace") module was scheduled to lift off between Sept. 27 and 30, but a forecasted cold weather front has pushed the targeted launch date back to Sept. 29 or 30. 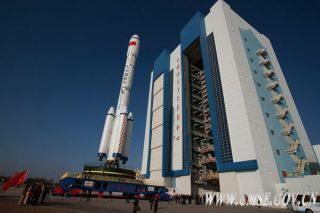 The module will launch on a Chinese Long March 2F rocket from the Jiuquan Satellite Launch Center in Northwest China. "This is a significant test. We've never done such a thing before," Lu Jinrong, the launch center's chief engineer, told state news agency Xinhua. China originally planned to launch Tiangong 1 earlier, but the liftoff was delayed when a Long March 2C booster, similar to the Long March 2F, failed to reach orbit. Chinese officials investigated the accident and recolved the issue before pushing forward with Tiangong 1 plans. China's integrated Tiangong 1 spacecraft and Long March 2F rocket is slowly rolled out of the vehicle assembly building to its launch site. Experts say the achievement will be a huge step forward for China's fledgling space program, and an important advancement toward the nation's goal of building a 60-ton manned space station by the year 2020. The module will also carry medical and engineering experiments onboard. Engineers conducted a full ground simulation of launch on Sunday afternoon (Sept. 25). Workers have made more than 100 upgrades to the launch site, and more than 170 technical improvements to the Long March 2F rocket, in preparation for Tiangong's mission, Cui Jijun, commander-in-chief of the launch site system and director of Jiuquan Satellite Launch Center, told Xinhua. These include a new updated computer center and command monitoring system at the Jiuquan Satellite Launch Center, as well as new systems to increase Mission Control's ability to adapt to changes that may occur during the mission. After the United States and Russia, China is only the third nation to independently launch humans to orbit. China's first manned mission, Shenzhou 5, occurred in 2003, and was followed by two more manned missions in 2005 and 2008.